Filmed in Miami, this Santo/Blue Demon crossover is a mess, though not for trying. There's simply too much happening in the script, and much of it happens somewhat vaguely and lacks impact. A wealthy heiress is kidnapped by a pair of small time thieves who are seeking a fast way to get out from under the thumb of gangster Lucky. A local detective (Cesar del Campo) takes the case and begins snooping around. One of his first stops is to see Lucky, who may have the contacts to help solve the mystery. Lucky suspects that a rival crook(screenwriter Fernando Oses) is somehow involved. He is, as he's working in cahoots with the. In the meantime, a scientist and his minions (including Santo's real-life manager, Carlos Suarez, who also regularly appeared in the Man in the Silver Mask's films) are stealing the bodies of young women from a local graveyard. The researcher is reviving the corpses and selling them to overseas the white slave market. After murdering a passing motorist and stealing his car, the kidnappers have the bad luck to intercept the body snatchers, who promptly take them captive. It seems the female criminal and the victim can provide blood for use in the reviving process. The mad researcher also falls under the former's spell. El Santo and Blue Demon are called in, and -- working around Santo's overseas wrestling commitment -- set out to track down the kidnapped girl. There are the expected fights before wrestlers, detective and the inappropriately named Lucky all converge on the criminal scientist's lair. 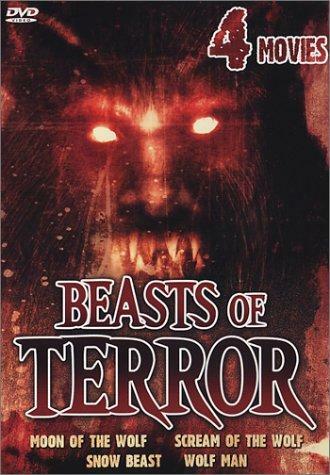 In spite of the title, there are no actual terrifying beasts in the film. The zombie girls are passive and listless. That only leaves a trio of extremely frisky and visibly happy Irish setters -- which the script calls upon to "chew a man to death" -- to uphold the title. Happy puppies just don't inspire fear, and it's obvious that all that's attracting them to the victim is that he's endlessly shrieking as they fumble and blunder about the confines of the call. I'm always a sucker for a film featuring the late Blue Demon (he passed away on 12/16/00 of a heart attack), but this is definitely lesser fare. Watch for bloopers, as one night scene where the Demon is driving and using a hand held radio to converse with the others. In one scene his striped shirt becomes a blazer, then reverts a moment later. Lacks an interesting fantasy theme, mad scientist not withstanding, and not all that successful in its action sequences. A 3 out of 10.